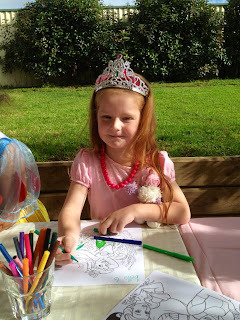 Each of the little princesses invited received a plastic tiara with a note in a pink envelope inviting them to the Royal Tea Party at our place on the party day. 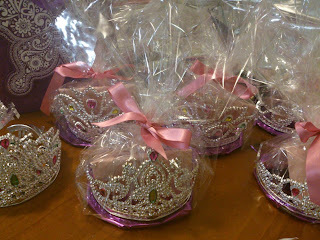 The crowns were then placed on a pretty paper wrapped cardboard disk and encased in clear cellephane with a pink ribbon. The cake took me FOREVER to make. 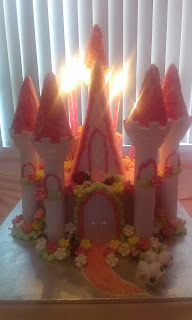 But thanks to the Wilton Romantic Castle Kit (which I happened to get on sale) it turned out adorable! Everyone loved it particularly my little birthday princess. We added the little mice as mice always make princess dresses in Disney movies. 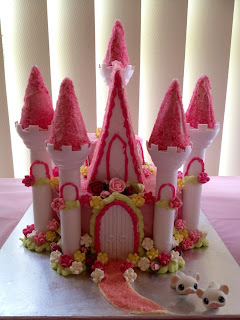 The first instruction on the cake kit was to make 100 flowers!!! Well, I just bought mine already made from the supermarket. Next time I'll make my own cake from scratch - this one tasted awful - pink betty crocker mix and canned butter frosting. It was thick though and held the turrets all together and the cones on top. 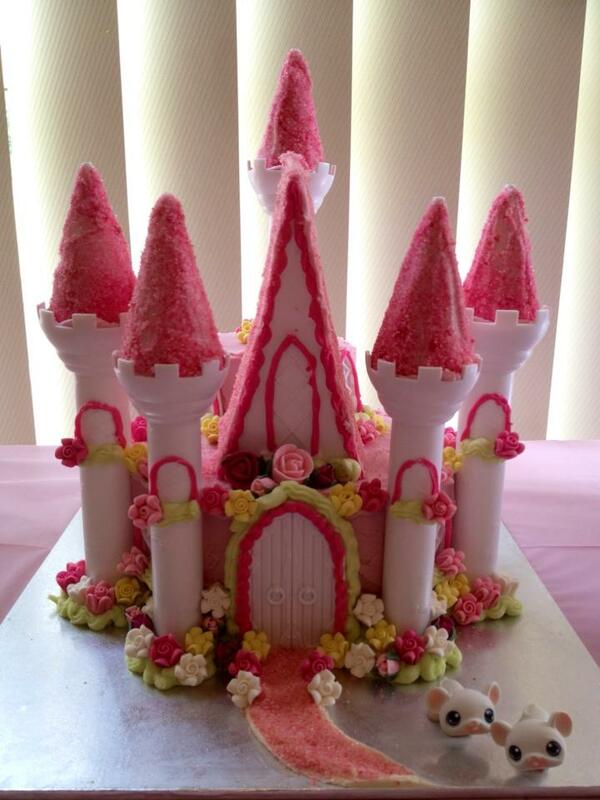 I cut a piece out of the top cake layer to shove the tallest turret in it. 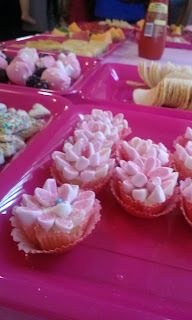 I covered the cones with buttercream icing and rolled them in sugar mixed with pink food colouring. Cheap marshmallows, then royal icing (1 cup pure icing sugar, 1 egg white) keep aside a little of the plain white for glue for the stalks and for the dots...colour the rest pink (or red) and dip the marshmallows in it. When set, add the stalks and the dots. 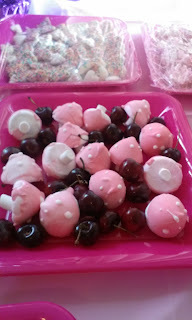 Arranged these on platters with cherries. We made flowers with balloons (two of one colour, five of the other) - simply tie together and twist around each other. We decorated the house simply with these and lots of pretty twisted crepe paper streamers. Really pretty and cheap. 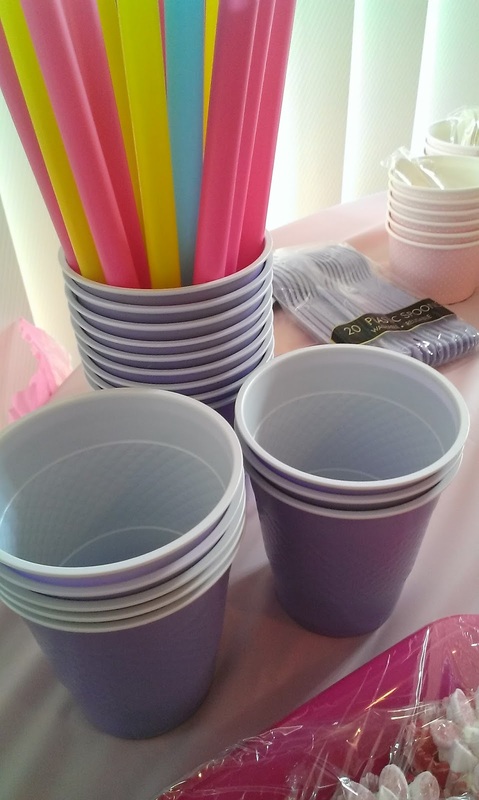 Pink, purple, big straws, and big pink square plastic platters. You can also see the mini gelato cups in the background. 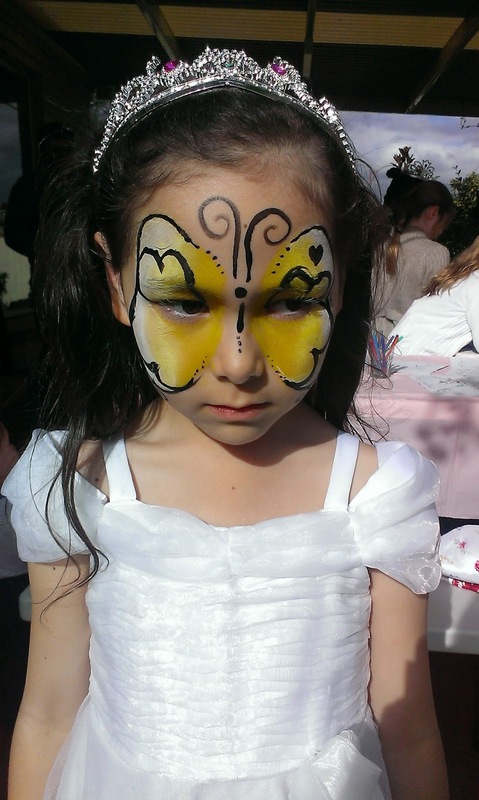 When the girls arrived we had face painting (done by my 18 year old eldest daughter - she did an amazing job). 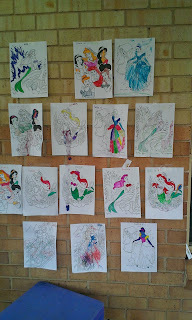 and colouring with a competition - the girls coloured and added glitter. All done outside. 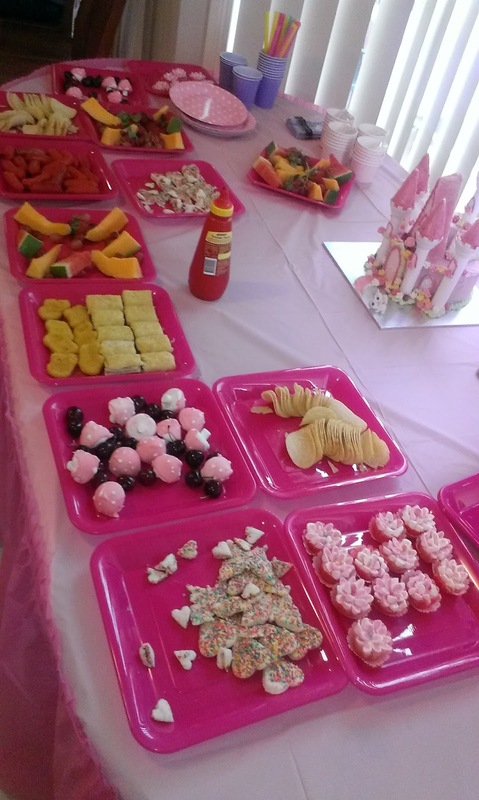 For food we had chips, nuggets, sausage rolls, mini frankfurts, fresh fruits, marshmallow mushrooms and fairy bread cut in love heart and butterfly shapes. Drinks were just fruit juice, water or apple juice. 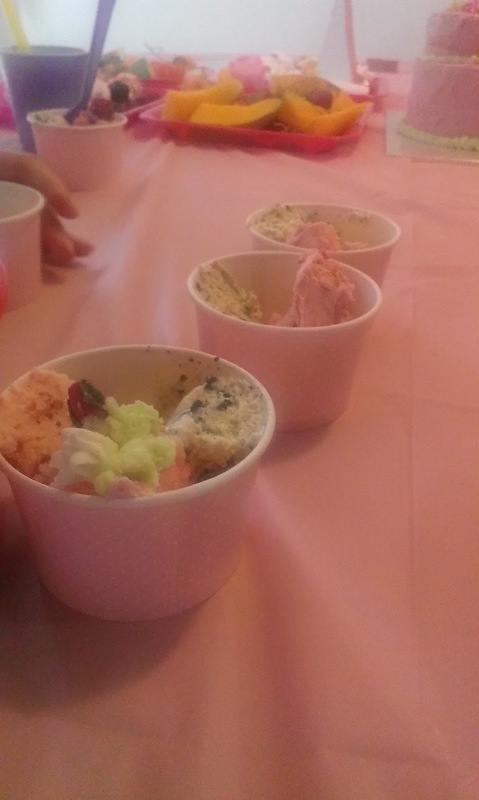 After cutting the cake we gave each girl a piece of cake and a sugar flower in a gelato bowl and I had two tubs of my home-made ice-cream - strawberries and cream and cookies and cream flavours. 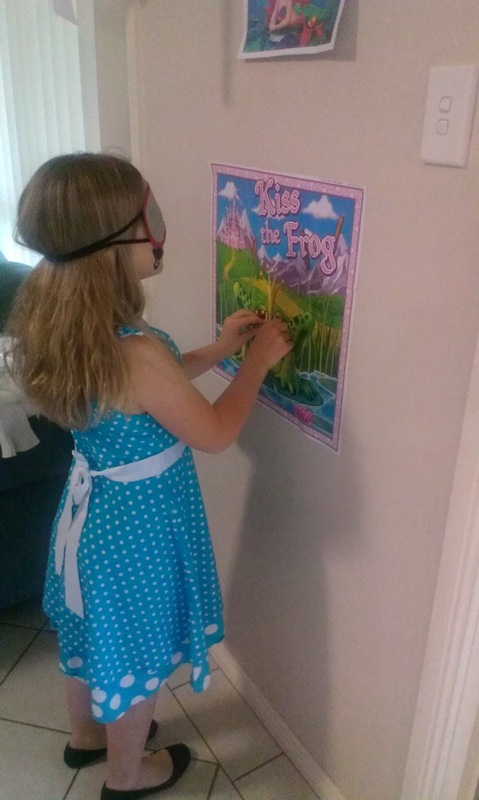 We always plan about six games for a party to fill the time properly. 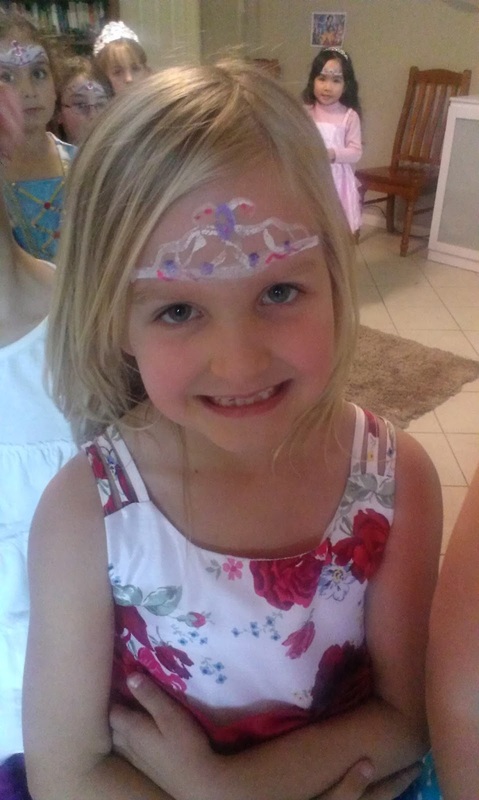 Besides eating time, arrival activities (face painting and colouring) and cake time we had three hours of party to fill in. There is nothing worse than kids sitting around with nothing to do. Four corners princess style (four pictures placed around the room - when music stops girls rush to one corner - guests eliminated by drawing from the hat) We just printed off pictures of princesses from the internet. Very "Australian" game - layers of newspaper wrapped. When the music stops you stop passing and open a layer to reveal a small prize (chocolate or sweet or something). The last layer is pretty paper and contains a special prize. Make sure you have enough layers for every child to open at least once. Little ones enjoying the colouring activity upon arrival. 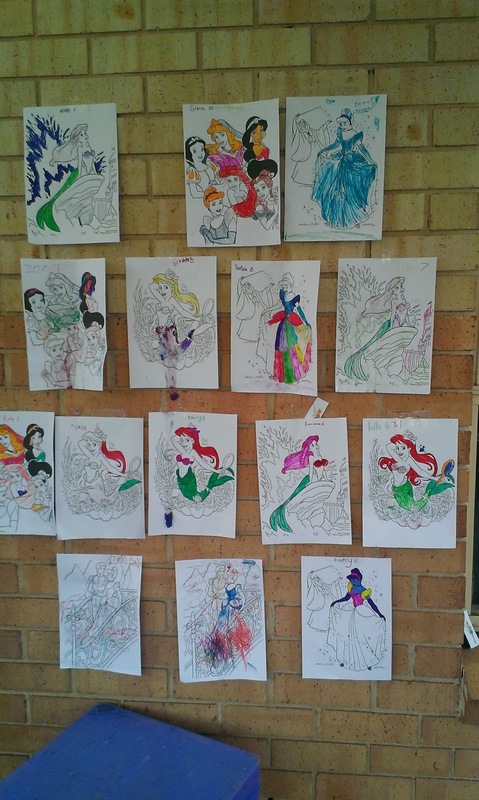 We provided cups of new marker pens and new glitter glues - we printed off a big selection of colouring pages of princesses from the internet. My own cupcake recipe with mini marshmallows cut in half and dipped in to coloured sugar to create tiny flowers - glue on with a blob of buttercream (home made is best). Even my four year old could help made these! 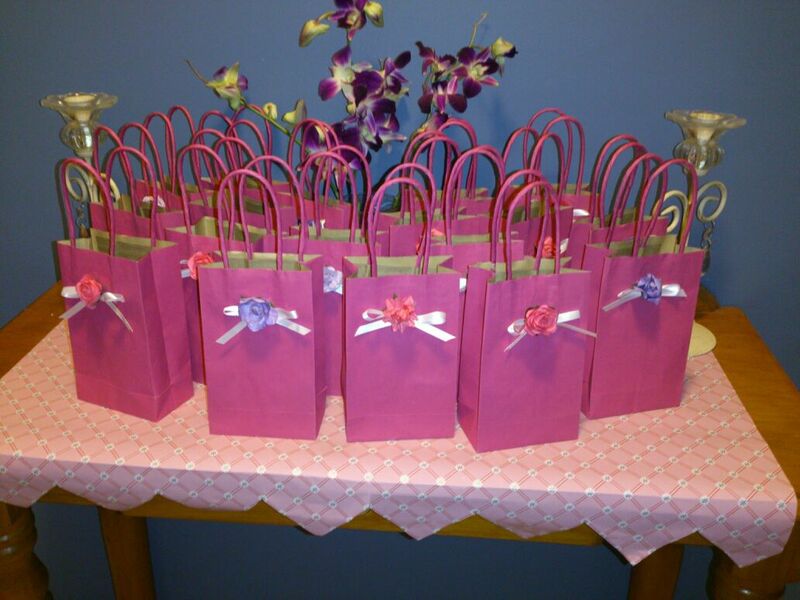 The gift bags (bought on sale) that she helped me decorate. 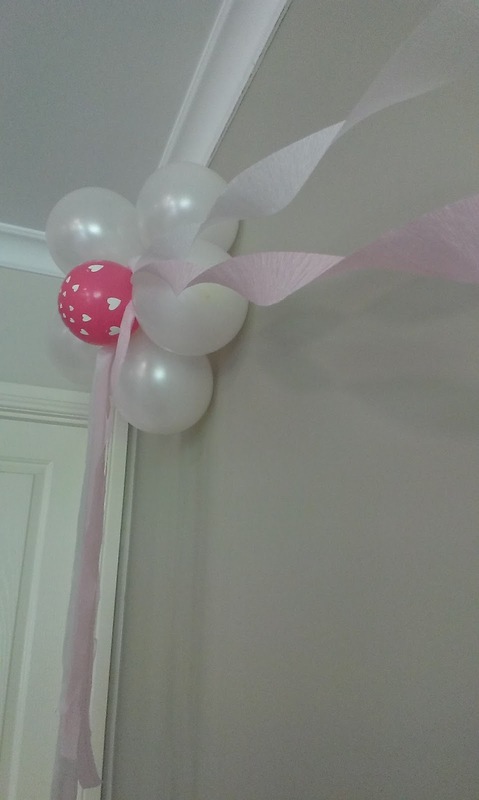 We had them in the hallway on arrival. All in all a lovely party and very economically done. 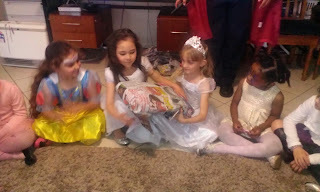 The girls all had a ball and our birthday girl said it was the best day ever as we all watched Disney Brave that night together as a family. Hello, Love this post and thanks for sharing! 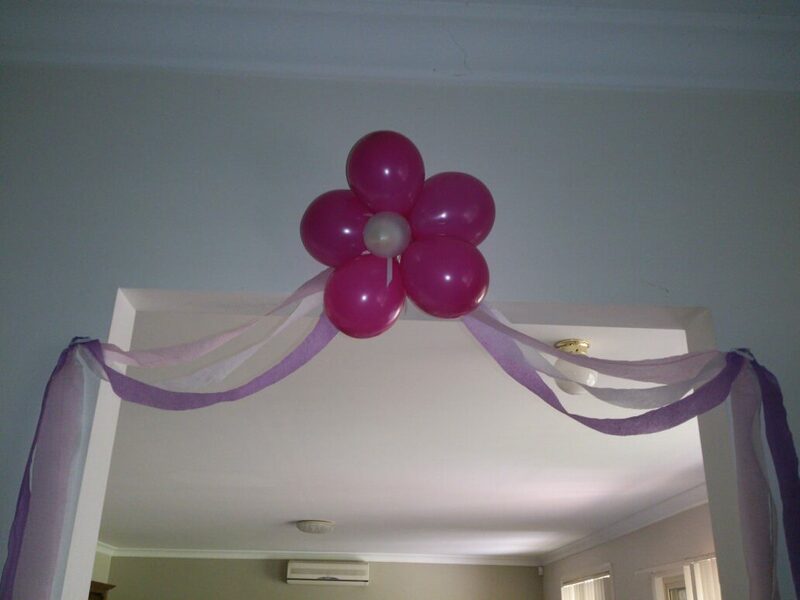 How did you fasten your balloon flowers to the wall without damaging the wall? Really a cute princess tea party. My friend is organizing a welcome party for her newly born niece at one of charming venues in Los Angeles next week. She is rushing for all the arrangements as she wants everything to be perfect and impressive. Gelato pans, cones, spoons, ice cream scoop freezer, pan liners and much more. I am married to a wonderful hardworking man and we have six amazing children - i love our surname which is Spanish and means "Little Snow Flower" - how pretty is that? we attend a fantastic church which reminds us of the good God gives us in every day. i love beautiful things, whether found or created, sharing delicious recipes and ideas for family fun, crafts and parties, inspiration and scrapbooking, organising and trying to be tidy!